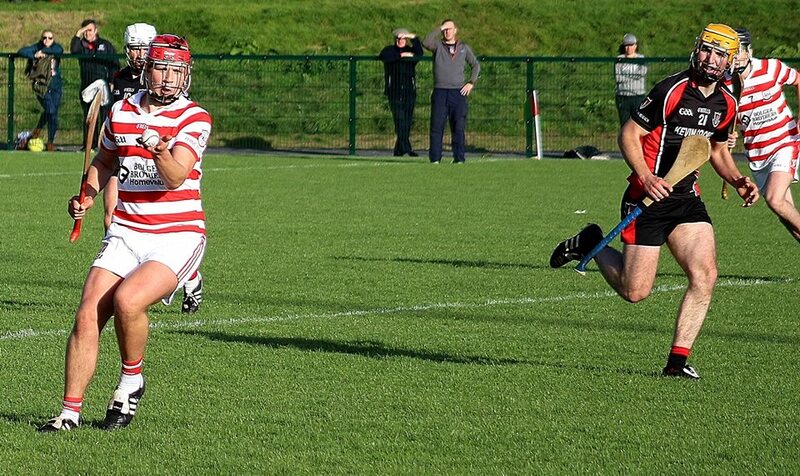 Paul Morris strikes the Ferns goal against Naomh Eanna in the championship opener. Christopher O'Connor inspired Ferns St. Aidan's with an additional time winning point as they eventually saw off an excellent Naomh Eanna challenge in this thrilling Pettitt's Senior hurling championship Group B game in Innovate Wexford Park on Sunday. The teams matched the brilliant sunshine as the hurling exploded in a tremendous 60 minutes where both held the initiative at different stages. Ferns turned the five-point half-time deficit around by the 43rd minute, having gone into a two-point lead to complete a seven-point turnaround, but they still had to withstand a tremendous Naomh Eanna burst in that highly-charged final quarter. This was a game where neither side ever threw in the towel, with the match in the melting pot right to the final whistle, particularly after Eoin Conroy had struck over a splendid point for the Gorey town side on 60 minutes to bring the sides level. However, Ferns grabbed the next opportunity, with Christopher O'Connor steering his effort between the posts three minutes into additional time to give his side a sensational victory. Michael Laffan's reinvention of Ferns is coming along nicely, as his side showed many changes, but their physical impact to go side-by-side with their skilful hurling hauled them back into this game. While they opened the scoring with a Jonny Dwyer point, Naomh Eanna enjoyed the ideal start, striking over five unanswered points through Pádraig Doyle (four, two frees) and Gearóid Cullen with a fine effort off the sideline to lead by 0-5 to 0-1 after just six minutes. Eoin Conroy was making an impact in midfield, with one of his fine runs ending when he was hauled down just on the fringe of the large square, while Pádraig Doyle was showing splendid accuracy in attack. Naomh Eanna with their fluent hurling were causing Ferns all sorts of problems, and with Doyle, Conor Hughes and Aodhán Doyle all firing over excellent long-range points, they moved into a 0-9 to 0-4 lead by the end of the opening quarter. Ferns, inspired by Paul Morris, now began to get into the action, responding with five points to reduce the deficit to 0-11 to 0-9. Then Morris had a 29th-minute goal disallowed for a square infringement, while at the opposite end came the score of the game just on the break. Eoin Conroy, having ripped through the defence on a great run, finished with aplomb, a splendid shot to the opposite corner of the net from an acute angle, which left his side leading by 1-12 to 0-10 at the interval. Within minutes of the re-start, Ferns signalled their intentions, as Benny Jordan steered two long-range frees between the posts, while Paul Morris and Christopher O'Connor followed almost immediately with further points to reduce the deficit to the minimum (1-12 to 0-14). The stage was now set for a splendid closing 25 minutes and the attendance was not disappointed. A Pádraig Doyle pointed 50-metre free helped Naomh Eanna briefly lift the siege, but it was not for long as Ferns responded, seeing a rising Paul Morris shot just go over the bar. But on 43 minutes Ferns got a crucial breakthrough. A long Tommy Dwyer free somehow found its way through a forest of hurleys to the lurking Paul Morris inside the defence, and the inter-county attacker kept his composure to crash a low ball to the net, restoring his side's earlier first-half lead (1-15 to 1-13). When Chris Turner and Jonny Dwyer extended their lead to four points by the end of the third quarter it looked as is they were about to assume control, but three Pádraig Doyle points (one free) and a Conor McDonald effort had the sides level (1-17 apiece) with four minutes remaining. Then came that dramatic climax that saw Ferns edge through to the narrowest of victories, but given the scale of their effort and hurling, few would have begrudged Naomh Eanna a share of the points. Ferns St. Aidan's: Mick Walsh; Patrick Breen, John Breen, Brian O'Neill; Ryan Nolan (0-1), James Tonks, Declan Byrne; Ciarán Roberts (0-1), Gavin Bailey (0-1); Jonny Dwyer (0-2), Benny Jordan (0-3, 2 frees), Tommy Dwyer (0-3, 1 free); Chris Turner (0-1), Paul Morris (1-5), Christopher O'Connor (0-3). Subs. - Conor Scallan for P. Breen (HT), Jeff Tobin for Turner (48). Naomh Eanna: Barry Kinsella; Peter Travers, Brendan Travers, Eoin Molloy; Tom Stafford, Seán Doyle, Gary Molloy (0-1); Aodhán Doyle (0-1), Eoin Conroy (1-1); Gearóid Cullen (0-1), Pádraig Doyle (0-12, 7 frees), Conor Hughes (0-1); William Cullen, Conor McDonald (0-1), David O'Brien (0-1). Subs. - Michael Murphy for G. Cullen (48), Charlie McGuckin for Stafford, inj. (50), Kevin Harrington for Hughes (52), Jack Cullen for W. Cullen (54). Composure and conviction during the second-half of this Pettitt's Senior hurling championship Group B game in Bellefield on Sunday gave St. Martin's their second win as they saw off Ferns St. Aidan's with relative ease. After a scrappy opening half in which both teams were guilty of some wayward shooting and niggling with their opponents, St. Martin's seemed to just wind the clock back to zero and came out a new side in the second period, easily dealing with Ferns' advances and taking some tidy scores along the way. Ferns were given the perfect start as Ian Byrne marked his return to Senior championship action after two recent Junior appearances with a well-taken goal from a 20-metre free in the opening minute. This was cancelled out almost immediately however, as Joe Coleman hit three frees and Ciarán Lyng put the Martin's in front. With Ferns really putting it up to the favourites, the game took on a very stop-start nature, as a number of scuffles at different stages and a lot of frees never allowed the game to flow as much as a spectator would like. It remained very close however, and as Coleman remained deadly accurate from frees, Tommy Dwyer, Ryan Nolan, Christopher O'Connor and Paul Morris kept the scoreboard ticking over for Ferns, leaving a point between the sides at half-time in favour of St. Martin's. On the resumption, St. Martin's showed why they were carrying the favourite's tag as they played with a lot more composure, particularly in defence and midfield, holding Ferns to a mere three points for the entire half. Probably the most vital part of the half came when defender Patrick Breen fumbled a pick-up, leaving Lyng to gain possession and find the net. Joe and Rory O'Connor, along with Lyng, continued the hit the scoreboard to give St. Martin's an easy win in the end and their second of the campaign. Ferns St. Aidan's: Mick Walsh; Brian O'Neill, John Breen, Patrick Breen; Ciarán Roberts, James Tonks, Conor Scallan; Tommy Dwyer (0-4, 3 frees), Paul Morris (0-1); Ryan Nolan (0-1), Benny Jordan (0-1), Jonny Dwyer; Christopher O'Connor (0-1), Ian Byrne (1-0 free), Chris Turner (0-1). Subs. - Pádraig Bolger for O'Neill, Jeff Tobin for Tonks. St. Martin's: Luke White; Willie Devereux, Patrick O'Connor, Conor Firman; Aaron Maddock, Paudie Kelly, Daithí Waters; Harry O'Connor, Mark Maloney; Rory O'Connor (0-2, 1 free), Darren Codd (0-1), Jack O'Connor; Joe Coleman (0-8 frees), Joe O'Connor (0-2), Ciarán Lyng (1-3). Subs. - Jake Firman for Coleman, Barry O'Connor for H. O'Connor, Michael Codd for Kelly. Jonny Dwyer on the attack against the Rapps. 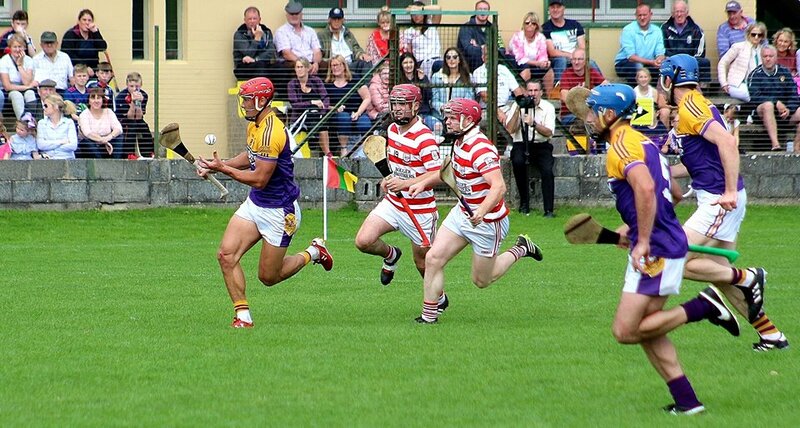 Rapparees knew that anything less than a victory simply wouldn't suffice as they approached Sunday's Pettitt's Senior hurling championship Group B clash with neighbours Ferns St. Aidan's in Innovate Wexford Park in dire need of their first set of points. However, I doubt very much if anyone in the Bellefield camp would have anticipated their complete dominance of this local derby as they swept to a commanding and fully-deserved 17-point success. It was clear that the Rapps were up for this game from the off, and it was undoubtedly their best performance at this level in a long time. And to produce it when the chips were down says a lot about the resolve of the players, but it must be assessed against the backdrop of one of the most listless and disinterested displays from Ferns since they returned to Senior ranks for the 2008 campaign. Only the always excellent Paul Morris could really hold his head up high after this shambolic show, contributing an admirable seven points from play on a day when so many of his colleagues simply weren't at the races. A symbolic triple substitution from the losers with 20 minutes left said it all. It wasn't the fact that three changes were made at the same time, as we've seen that before, more so the identity of the men replaced as Tommy Dwyer, Benny Jordan and Ian Byrne would normally be regarded as leading lights on this team. It was interesting to see Liam Ryan located at centre-forward for the winners and, though he grabbed a goal and won a penalty in the first-half, he wasn't the stand-out performer for the Rapps in that spell. Instead that accolade fell to his county colleague Kevin Foley who was a vibrant ball of energy at midfield, constantly racing on to breaks and making clever use of possession. The Rapps went with three physically strong ball-winners in their half-forward line and three smaller, lively attackers inside, and it worked a treat as Ferns had no answers. And any fears that Ryan might be missed under the opposition's puck-outs were brushed aside in the second-half in particular as Ricky Fox read the play to perfection and was superb at number six. The accuracy of both sides in the first quarter had to be admired. Indeed, after a Kevin Foley wide with just over one minute gone, an impressive 17 point-scoring attempts were successful as the Rapps established a 10-7 lead before Darragh Pepper had their second miss in the 17th minute. The town team seized the initiative straight away and never let go, with Tomás Mahon pointing two frees, the second after a foul on Kevin Foley who then intercepted the puck-out and made it 3-0. Jonny Dwyer hit one good point from the left wing for Ferns but they managed to stay in touch largely through the efforts of Paul Morris, with one of his three points whizzing over the bar when a goal was a possibility. Creating space came a lot easier to the Rapps, with Darragh Pepper and Kevin Ryan joining Foley and Mahon on the list of marksmen, and they really cut loose in the second quarter when Ferns were outscored by 1-6 to 0-2. Even a penalty miss didn't deter them, with Tomás Mahon blasting over the bar rather than under after Liam Ryan was fouled in the 24th minute. That point made it 12-7, and Pepper added another before the Ferns net did ripple after the next Rapps attack. James Peare's line ball down the left flank found Mahon who handpassed inside to Liam Ryan, and the inter-county full-back with a penchant for scoring widened the gap to nine. A barn-storming Richie Farrell run and subsequent Ryan Mahon handpass nearly led to a second goal moments later, but Pepper's shot was blocked for a '65 duly converted by Tomás Mahon. It was 1-16 to 0-9 at the break, and the very least we expected was some sort of Ferns fightback. However, it didn't materialise, with the Rapps adding another 1-3 inside six minutes and winning the first five Ferns puck-outs to leave neutrals rubbing their eyes with disbelief. The goal came from a lovely move, with Pepper's handpass finding Ryan Mahon who flicked the ball to the side of the advancing Mick Walsh before tapping it into an empty net. Walsh later made a fine save to deny Kevin Foley after a brilliant Tomás Mahon crossfield pass, and the fact that seven of the last 15 points were registered by Ferns did nothing to put a better gloss on the scoreline. One other notable aspect of the game was the refereeing debut at Senior level of Shane Quinn, a young man not long out of Under-21 ranks who kept a clean sheet between the posts for Ballygarrett in their Intermediate win on the previous evening. He did a fine job, and hopefully it will be the first of many assignments for him in the top flight. Ferns St. Aidan's: Mick Walsh; Declan Byrne, John Breen, Patrick Breen; Pádraig Bolger, James Tonks, Ryan Nolan; Tommy Dwyer (0-4 frees), Benny Jordan (0-1); Gavin Bailey, Paul Morris (0-7), Ian Byrne; Jonny Dwyer (capt., 0-2), Christopher O'Connor (0-1), Chris Turner. Subs. - Eoin Murphy for Bolger (29), Brian O'Neill for Dwyer (40), Peter O'Toole for Jordan (40), Jeff Tobin (0-1) for I. Byrne (40). Rapparees: Eamonn Furlong; Ben Edwards, Dillon Redmond, Tom Wall; Jack Kelly (0-1), Ricky Fox, Anthony Roche; James Peare (0-1), Kevin Foley (capt., 0-3); Richie Farrell (0-1), Liam Ryan (1-2), Kevin Ryan (0-2); Darragh Pepper (0-5), Tomás Mahon (0-12, 8 frees, 2 '65s, 1 pen. ), Ryan Mahon (1-0). Sub. - Ed Tobin for Roche (55). Tommy and Jonny Dwyer in pursuit of Lee Chin in the game v Faythe Harriers. Two late frees from Tommy Dwyer gave Ferns St. Aidan's a share of the spoils as they came from behind to deny Faythe Harriers their second win in Group B of the Pettitt's Senior hurling championship in Bellefield on Sunday. This was a hugely entertaining encounter with both teams desperately in search of a second victory as the hunt for the third and fourth spots in this group becomes ever more interesting. The hunger of Faythe Harriers was evident as they got off to a flying start, with Lee Chin pulling the strings on the '40, catching a mountain of ball, laying off passes and finding the target on four occasions in the opening quarter. It could have been even better for the Wexford town side after they won an early penalty, only for Rhys Clarke's stinging shot to be excellently saved by Mick Walsh. It took Ferns a while to settle into the game, only hitting their second point midway through the half. But they then hit a purple patch, outscoring their opponents by five points to one with Ian Byrne and Christopher O'Connor doing the honours, leaving them only trailing by two at the break. The beginning of the second period was the opposite of the first as it was Ferns who hit the ground running, edging themselves in front within eight minutes. Paul Morris caused panic every time he got the ball, scoring two points and putting a goal chance barely wide. Rhys Clarke missed an equally good opening at the other end before Ferns were given a huge boost when Chris Turner reacted fastest to the breaking ball and finished to the net with ease. The final period was real dog-fight with both teams going at each other with everything they had. Morris, in excellent form, continued to torment the Harriers defence but four points from Chin edged his side in front as the game headed into added time. But Ferns weren't finished yet and earned themselves two frees in injury time which Dwyer calmly put over, leaving the last eight to be decided in the final round of games. Ferns St. Aidan's: Mick Walsh; Patrick Breen, John Breen, Brian O'Neill; Ryan Nolan, James Tonks, Conor Scallan; Tommy Dwyer (0-3, 2 frees), Gavin Bailey (0-1); Jonathan Dwyer (0-1), Benny Jordan, Ian Byrne (0-2); Chris Turner (1-0), Paul Morris (0-4), Christopher O'Connor (0-4, 3 frees). Faythe Harriers: Ian Scallan; Cormac Byrne, Richie Kehoe, Ross Lynch; Brendan Mulligan, Colm Heffernan, Alex Lynch; Michael Hanrahan, Rhys Clarke; Wayne Mallon, Lee Chin (0-12, 7 frees, 2 '65s), John Bridges (0-1); Pádraigh Farrell (0-4), David Mooney (0-1), Shane Wilde. Subs. - Stephen Kearney for Wilde, Dean Walsh for Mallon. Gavin Bailey in action against Oulart/The Ballagh. Three second-half goals gave Oulart-The Ballagh a comfortable victory over Ferns St. Aidan's in the final round of Group B in the Pettitt's Senior hurling championship in a blustery Bellefield on Sunday. The win sees last year's county champions face Shelmaliers in the quarter-final and sends Ferns into a relegation play-off with last year's county finalists, Cloughbawn. It was a game that Ferns needed to win to have any chance of qualification and they started off the game with a steely determination that saw them go three points ahead in the opening minutes, and go in at the break on level scores. However, the game changed completely in the second period as Oulart turned on the style, hitting two goals before the final quarter that really finished the game as a contest. Ferns could take a lot of heart from their first-half performance as their dogged defence fed their forward line with quality ball, which Paul Morris, Christopher O'Connor and Jonathan Dwyer turned into scores. Oulart's response came in the form of points from Nicky Kirwan and Des Mythen but Ferns showed that they meant business midway through the half with a goal from Eoin Murphy who capitalised when a high delivery wasn't dealt with sufficiently by the Oulart defence. But the eventual winners finished the half strongly hitting four scores without reply, three coming from the ever-accurate Kirwan. And the nippy corner-forward began the second-half as he finished the first with two points inside as many minutes on the resumption, in a five-minute spell that saw his side go three points clear with help from Mythen and Tommy Storey. Chris Turner hit one back minutes later but at this point the game swung in Oulart's favour after Billy Dunne and Storey hit the net to stretch the lead to nine. The second goal being a real killer blow for Ferns as they just couldn't get back into it as Oulart were now on fire, finishing the game with further points from Storey and Kirwan and a goal from Martin Óg Story to round up a fine display that puts Ferns into the relegation dog-fight. Ferns St. Aidan's: Mick Walsh: Declan Byrne, James Tonks, John Breen; Ciarán Roberts, Brendan Jordan, Conor Scallan; Eoin Murphy (1-0), Gavin Bailey (0-1); Jeff Tobin, Jonathan Dwyer (0-1), Chris Turner (0-2); Tommy Dwyer (0-1), Paul Morris (0-2), Christopher O'Connor (0-3, 1 free). Subs: Ryan Nolan for Tobin, Patrick Breen for Byrne, Brian O'Neill for Roberts, Padraig Bolger for Murphy, Derek Thorpe for Nolan. Oulart-The Ballagh: Conor O'Leary; Anthony Roche, Keith Rossiter, Barry Kehoe; Michael Jacob, Kevin Sheridan, Peter Murphy; Tommy Storey (1-3), Rory Jacob; David Redmond (0-1), Des Mythen (0-3), Murtha Doyle; Martin Óg Storey (1-0), Garret Sinnott, Nicky Kirwan (0-8, 4 frees). Subs: Billy Dunne (1-0) for Doyle, Doyle for Redmond.